This page offers a general presentation of Marc-André Roberge’s book Opus sorabjianum: The Life and Works of Kaikhosru Shapurji Sorabji and gives a link to download, free of charge, the complete PDF file. Opus sorabjianum: The Life and Works of Kaikhosru Shapurji Sorabji is the long-awaited biography of the English composer-pianist and critic by the musicologist Marc-André Roberge, author of the Sorabji Resource Site (inaugurated in August 2010). It was finally made available on the very day of 121st anniversary of the composer’s birth (14 August 2013) in the form of a fully searchable PDF file that can be downloaded at no cost and read on screen or printed and bound for easier reading. It is regularly updated to fix problems and take into account new findings. Bookmarks: Whereas the text file comes with a detailed index of names and subjects, the PDF file has bookmarks for each entry of the table of contents to enable quick navigation. The internal links make it possible to alternate between the reference to a musical example and the example itself, and between the section where a work is discussed and the catalogue entry. Dedication: Opus sorabjianum is dedicated jointly to Paul Rapoport and Alistair Hinton, whose importance in the shaping of my Sorabjian activity cannot be underestimated. They have provided essential help from the very start of this huge research project. A full dedication will be found in the appropriate section of the book. In 1985 Rapoport had made me the regal gift of a printout of a preliminary version of his catalogue of Sorabji’s works. This enabled me to be ahead of interested persons in my knowledge of the details of the composer’s huge production, most of which was then entirely unknown. A few years later he gave me the initial impetus to tackle the present large-scale project. Hinton, the composer’s residual legatee, most generously opened the doors and documentary treasures of the Sorabji Archive and answered more queries and questions than anyone could ever imagine. Our correspondence since 1990, and especially since 1996, when we switched to email, fills hundreds of pages. Acknowledgements: In addition to Rapoport and Hinton, many persons and institutions (in fact some 160) have helped me over the years by answering queries, offering nuggets of information, providing copies of documents such as letters, giving permission for use, etc. Full acknowledgements will be found in the relevant section of the book. Index: The index has been prepared with the help of two custom macros written with PerfectScript, the macro language of WordPerfect™ by Corel. Unlike my other macros published on WordPerfect Universe and on my personal page, these macros, which are too task-specific, are as yet unpublished (and are unlikely to be made available). Screenshots of the dialog boxes are available here: Add Markers and Index Codes to “Opus sorabjianum” and Index Generator for “Opus sorabjianum”. 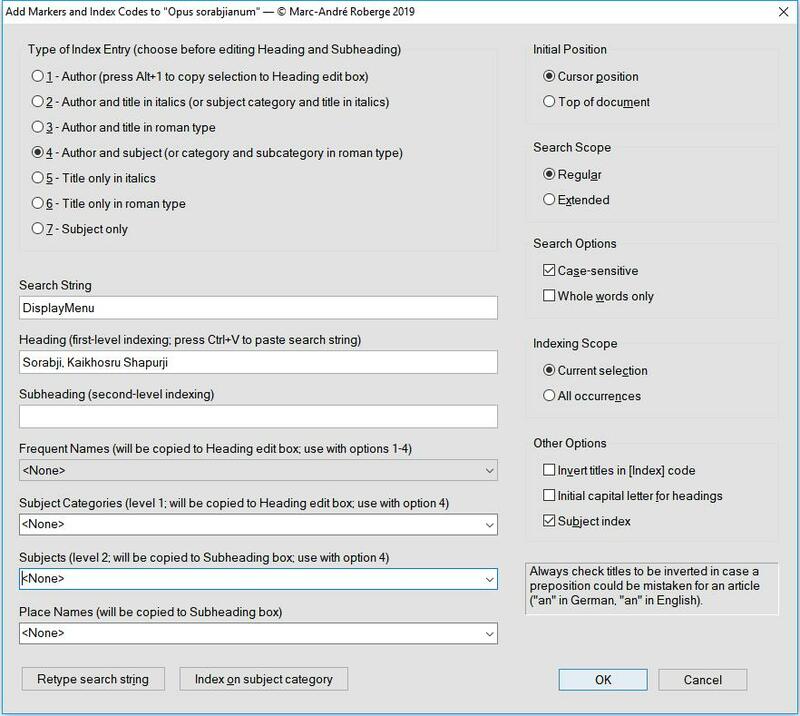 The number of options gives an idea of the complexity of the task involved in expanding the somewhat limited capabilities of the word-processing software for creating a usable index. Relationship to Sorabji: A Critical Celebration: Any reader familiar with Paul Rapoport’s Sorabji: A Critical Celebration (1992) will see quickly how Opus sorabjianum (which is not the work of a professional book designer) is indebted to it in matters of layout and format. This being said, the new book should never be seen as a replacement of Rapoport’s pioneering symposium, which laid the basis for serious research on Sorabji; it is rather a continuation that draws on a larger array of sources. Readers who are considering taking the PDF file to a copy shop for printing and binding should make sure that they have the latest version. They should also read the section “Internet Edition and Printing Instructions” in the Preface and experiment before starting a print job. Sound clips for the musical examples (in MP3 format) are available, as are several Sorabji-related illustrations, in most cases photographs taken by the author during his research trips. Opus sorabjianum is distributed free of charge, and copies of the electronic file may be made available to others as long as there is no charge and that it remains unaltered. This book is a free contribution to knowledge and to the cause of Sorabji and must always remain so.